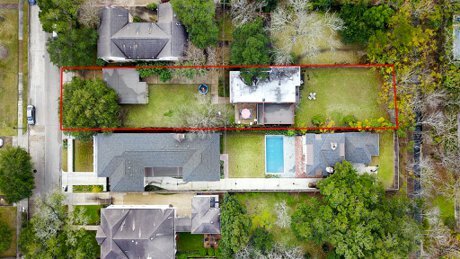 6528 Mercer Street | LOT FOR SALE in West University Place, TX! Oversized 14,000 sq ft. West University place lot. Lot dimensions are 50' x 260', along with an abandoned 50' x 20' easement at the back of the property. Currently has a 3,054 sq ft contemporary/modern home built on the lot. 4 bedrooms, 3 full bathrooms. Livable, currently tenanted. Property took about two inches of water on the first floor during Hurricane Harvey. Damage was remediated with new ceramic tile floors, fresh sheetrock and insulation on first floor. Current floorplan is designed for entertaining, with first floor bedroom and full bath, informal living area and kitchen, and formal dining area and large living room with sliding doors leading out onto the patio. Second floor living, with master bedroom with walk-in closet, full bathtub, and walk-in shower, utility room, and two secondary bedrooms with walk-in closets and balcony overlooking the yard. Owner/Agent is Roger Martin of Roger Martin Properties. Seller is selling property as a lot, will make no repairs.. Excellent location near Colonial Park, West University Elementary School, the West University Public Library, the West University City Center, and the Medical Center. Zoned to West University Place Elementary, Pershing Middle School, and Lamar High School. Please check enrollment availability.